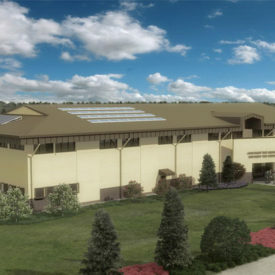 The facility includes administrative, operations and electronics laboratory testing functions for the 46th Test Squadron at the Air Force’s Armament Center (AAC). The facility is designed for classified functions, includes a SCIF and other areas capable of being upgraded and certified as future SCIF’s, all IAW DCID 6/9 criteria. The facility is totally access-controlled throughout for future functional flexibility. 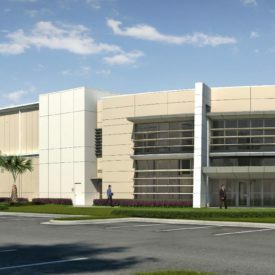 The facility requires access-controlled “classified” areas to be sub-compartmentalized from each other to meet standards for future SCIF certification. 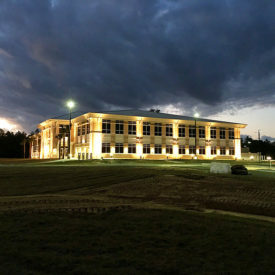 The facility includes laboratories, administrative spaces, an Air Operations Center (AOC), a certified SCIF, a classified Auditorium and classified conference rooms. Classified areas include extensive use of access flooring with cable trays, conduits and protected distribution systems (PDS) for the massive quantities of communications and LAN cabling for SIPRNet, NIPRNet and other communications systems. 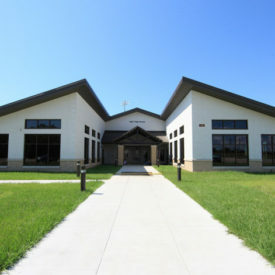 A large portion of the building requires a windowless environment; therefore the exterior architectural design vocabulary includes split face masonry pilasters to provide desirable rhythm and scale to the building facade.